Drainage Stone That Doesn’t Drain? Drainage stone is supposed to drain. 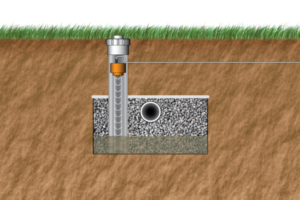 After all, typical 3/4″ to 1.5″ gravel used in septic trenches has a lot of void space. In my early days working at an engineering firm with a materials testing lab, I tested some typical, but fairly dirty, septic gravel and it had approximately 40% open space. So water should flow easily through that, right? 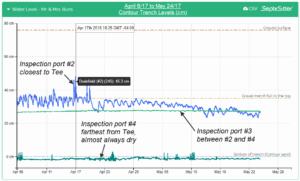 As part of our SepticSitterTM field validation program, we have been monitoring trench ponding levels in several leachfields located in PEI, Canada. We have observed some interesting results. Mr. & Mrs. Buns (the name is made up but the system and data is real) have a 15 year old raised-bed, “Contour” drainfield. Contour drainfields were developed and popularized in Nova Scotia, Canada, and consist of a single (usually gravel) trench, with a level bottom, constructed to follow a natural contour of the land (across the slope). The trench for this three-bedroom home is 138 ft long by 4.5 feet wide. Mr. & Mrs. Buns are the only two occupants in the home now. It would have been loaded more heavily for several years after this system was first constructed when their children were also living at home. 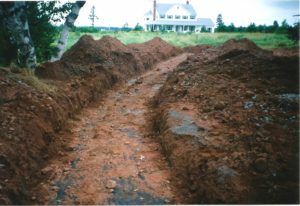 Contour drainfield trench under construction in September 2000, just prior to final backfill. The trench is gravity trickle-fed at the midpoint with a Tee which attempts to cause the flow to split evenly in each direction. This often doesn’t happen in reality as most of the flow tends to go in one direction or the other. Site plan of Mr. & Mrs. Buns septic system showing Septic Sitter sensor locations. 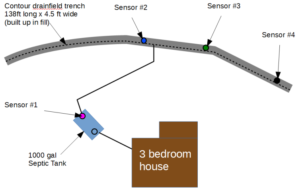 In 2015 we retrofitted inspection ports and installed SepticSitterTM sensors at three locations in the trench. The inspection ports extend down to the bottom of the gravel and permit monitoring of effluent ponding levels. We also installed a sensor in the septic tank. Three inspection ports containing SepticSitter ultrasonic sensors were retrofitted to the gravel trench to permit automatic monitoring of ponding levels. As the data from the drainfield sensors show, the effluent distribution is not very even at all. During times of high flow, rainfall events or snowmelt, the middle of the trench (inspection port #2) ponds to the top of the gravel or even higher (see the blue line on the graph). Otherwise, ponding levels fluctuate between 20cm to 35cm (8″ to 14″). 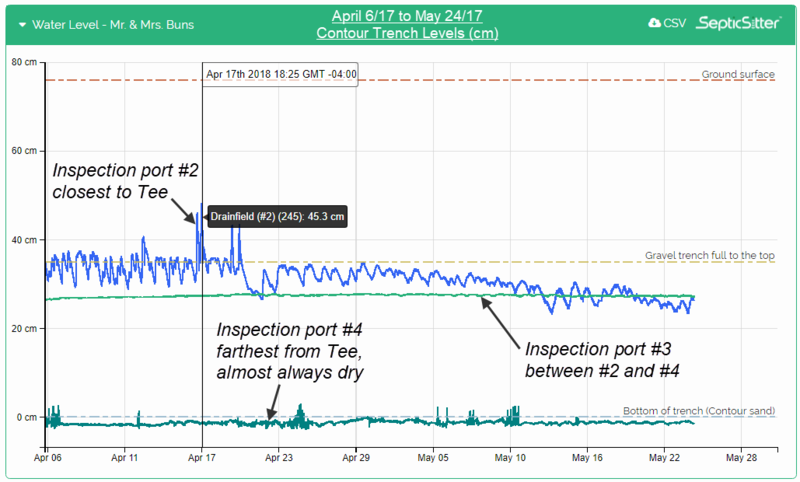 At the location of sensor #3 (light green line on graph) the trench is typically ponded about 25cm (10″) deep with very little variation. But near the end of the trench, at location #4 (dark green line on graph), the trench is almost always empty. So why is this happening? The septic tank has had an effluent filter on it since the system was first installed, so I don’t believe that a lot of solids could have escaped from the tank and clogged the pipe or drainfield. The stone used in this system was quite “dirty” and contained a lot of fines (sand, silt, clay). If you saw it however, I doubt you would think it was dirty enough to prevent water from flowing freely through it. However, perhaps over the years, biofilm developed in between the gravel particles, so that it started to bridge the void spaces between the stones. Could biofilm have developed to the point where it has started to interfere with the free movement of effluent throughout the trench? That is my current theory, however I would be interested to hear what you think. How would you investigate or remediate this system? In your experience, do you believe the gravel trench can be restored to a “free-draining” condition with more equal ponding levels throughout? Tell us your thoughts in the comments below! SepticSitter Launch Feb. 23/17 WWETT 2017! Dynamic Monitors is launching the SepticSitter system this week at the WWETT show. Come by Booth 4312 and see a live feed of the data from this site. You can tell me in person what you think is going on with this system. ANUA showcasing IVM6000-LP at Pumper Show! I suspect variability in biomat formation throughout the trench may be the primary factor. If gravity-fed, the biomat will develop more in the area receiving the majority of the effluent holding effluent for longer periods. As you move away from the inlet T, less septic effluent will make its way there during regular use resulting in less biomat formation, and therefore less ponding during peak use or heavy rain. Variability in sand hydraulic conductivity may also be a factor. Thanks for your comments Leah! I definitely agree there would be considerable variability in biomat formation throughout the trench. Traditionally when discussing biomat, people focus on that which forms at the infiltrative surface, ie. at the gravel/soil interface on the bottom and sometimes on the sidewalls of the trench. But I assume you are referring to variation in biomat formed between the gravel pieces. The fact that the gravel close to the T would be receiving most of the effluent could certainly promote accelerated build up of biological matter between the pieces in that area. Also, just fyi, the "sand" that was used for 3" filter sand layer along the bottom of the trench and the imported fill itself met the PEI regulations at the time, but would not have even come close to meeting the standards used in Nova Scotia! Was the ditch perfectly level ? Personally I'm no fan of contour ! Any of them I see are to the point of leaking or the grass is heavy and wet that grows on top ! I don't know, just something I have seen ! Very wet at one point in the ditch and dry at another point in the ditch ! Pipe has to be level for even distribution I'm a thinking ! Anyway have to catch up to you ! Thanks be in touch !! Hi Dave, the trench was supposed to be installed level, and I think for all intents it was. The installer used a laser level to set his grades and my technician did some spot checks before it was covered over. I think there could still be some normal variation of a couple of inches here or there across the bottom, which is just part of the normal limitations of construction. As to why this trench is ponding and appears to be exceeding the long term acceptance rate (LTAR), I would put the blame mostly on the poor quality septic fill that was, and still is, allowed to be used in PEI. As you are aware, our PEI guidelines allow contour systems to be installed using filter sand and imported fill material which are not up to the same standard as what Nova Scotia and most other jurisdictions have been using for several decades. Sieve analyses performed on samples from the pit showed it to contain 12% - 15% fines (passing the #200 or 75um sieve) which met the PEI guidelines. For others who are not aware, PEI allows up to 15% fines content in septic fill. In the years that followed after this system was installed, I developed my own higher standards for septic fill, which has been based on published research and guidelines from other jurisdictions and my own experience. I have seen many other systems over the years on PEI which are overloaded and ponding excessively which I attribute to poor quality fill that was used which met provincial guidelines. Hopefully, as I acquire more data from PEI drainfields being monitored with Septic Sitter, I will be in a better position to convince our regulators that bringing our fill specifications in line with the rest of the continent is in the best interest of septic owners on PEI and the environment. We have done quite a bit of research on this issue and have verified what you have seen but not so dramatic a difference. I believe that the stone bridges/dams in areas so that the ponding levels across the bottom can be different. As the one area gets loaded (since in gravity fed systems there is ALWAYS differential loading in the trenches, areas of the bottom and sidewall thin and thicken causing occasional "breaks" in the dam and then you get some evening of the levels. We have only observed this with pipe-stone systems. I do not believe that it has any relationship with the fines in the stone, since in our experiments we had REALLY clean stone (<0.1% fine material). Thanks for your comments George! Very interesting to know that you have seen the same thing happening at the Massachusetts Alternative Septic System Test Center, and with clean stone. Do you have any idea how long it takes for these biomat dams to form? Are we talking a couple of years or more like 8, 10+ years? Do you see this happening with pressure dosed trenches or just gravity, trickle-fed trenches? Have you experimented with any methods which were successful in dissolving or breaking down these biomat dams and restoring the gravel to its previous free-draining state? I think you are correct with the biofilm theory. However, I'm not sure it's biofilm plugging the void spaces between 1/2 - 3/4" gravel particles. I think the biofilm growth is in the soil below the gravel. "Dirty Stone" would also exacerbate the failure of the soil with fines. We see this same thing with septic tanks that gravity feed to a d-box. The beginnings of the trench will be the first to experience ponding because it gets the highest loading rate as effluent is absorbed long before it gets to the end of the trench. As the beginning trench develops a biofilm, inhibiting absorption of the effluent, the effluent is pushed down the trench to other parts that don't have the biofilm growth on it. I've always been told that this is called a "progressive failure" and common for gravity fed drainfields. One reason Orenco has always advocated pressure distribution as the only means of ensuring equal distribution along a drainfield trench. Hi Garry-Lee, thanks for your comment and insights. Just to be clear, the top size of this gravel is 1.5", not 3/4", but I doubt that would make a significant difference with this phenomenon. I agree the fines from the dirty gravel would exacerbate the clogging/failure of the soil and I am with you on the benefits of pressure distribution. However, in this particular case, I don't see how biomat formation at the gravel/soil interface would explain the uneven ponding levels. With clean, free draining stone, as soon as the effluent started to pond even a little bit, that should cause it to push farther down the trench. If there were some localized low spots under the gravel close to the centre-feed Tee, I could understand if effluent ponded an inch or two more in those places. But this doesn't explain a liquid height discrepancy of 10" and over 20"! In my mind, there must be some sort of blockage in between the gravel pieces themselves to cause such uneven ponding levels. I agree with the theory and have witnessed it myself on a few occasions. We have even seen this happen in a bed with pressure distribution. In most remedation cases we use a terralift and some pretreatment or a combination of both. Thanks for your comments Bernie! I am surprised you have seen this happen with pressure distribution...I think it would take longer for these biomat blockages to form if the effluent distribution throughout the gravel is more even. I have heard of Terralift being used to open up soil below and between drainfield lines. But you have used it directly in gravel trenches? Wouldn't you be concerned about clogging up the gravel even more with those little styrofoam pellets that get injected? Or can you do the Terralift with just high pressure air, and no pellets? Are your retrofitted ports connected via a T to the perforated pipe, or are they sunk into the gravel trench? Hi Steve, the retrofitted ports are not connected in any way to the perforated pipe. They are off to the side of the perforated pipe and extend to the bottom of the gravel trench. I have seen in the past that if they used Lime Stone that the powder that washed off the stone will clog the underside of the stone area. Then the water can not get to the sand base. Thanks for your comment John. Yes, I have heard of this and read papers on this too. Just wanted to clarify however that in this case, I am thinking that biomat has not only formed on the bottom of the trench, but in the large void spaced in between the actual gravel pieces.